This is one of the many psalms attributed to David, who does not specify in what circumstances he wrote it. 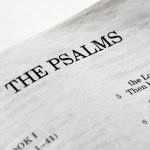 Psalm 17 is a psalm of call where the psalmist implores the protection and mercy of the Lord during a threat of death when his enemies persecuted him. Unlike some other Psalms, at no time does David doubt that God hears him and will deliver him from his enemies by divine judgment. In the first few verses, David shows himself in clean conscience, and expects divine justice to be done. David asks not only the condemnation of his oppressors, but the judgment of both sides. He is not afraid of God’s judgment, for he knows that he punishes only those who deserve punishment and gives victories to the innocent. It is not difficult to see why David has so much confidence in divine justice. In the previous Psalms he has already begged for and deserved God’s mercy even in the most difficult times. As he knows himself as a righteous man, who has not deviated from the divine path, who has not uttered sinful words and has only suffered the insults of his enemies, he is open to judgment, and asks God to be brief. In these verses, David calls for divine protection. He begs for refuge in the Lord’s wings with a poetic language, expects the wonders of God’s benevolence, protected from the wicked who want to kill him. He devotes these verses to speak of the wiles of his enemies. Described as violent and insolent, they have a closed heart and attack like a lion, a beast that corners its prey, just as they have done with it. But even so, David was not afraid. Even knowing of the ferocity of his enemies, he knows of the superiority of his God. In these closing verses, he begs God to fight the wicked, who with his sword deliver him from all evil with his divine wrath. He asks that they lose all that God has given him: family and life. Certain of divine justice, David longs for the moment when he will contemplate the face of God and feel satisfied to have been made in the image and likeness of the Father. This passage is crucial to the idea of immortality preached by the Bible in the Old Testament. David foresees the day when he will awaken in the Kingdom of Heaven, in the glory of the peace of Christ, and stand before God. In this Psalm 17, David knows that divine justice will come while he is still on earth, he never doubts it.